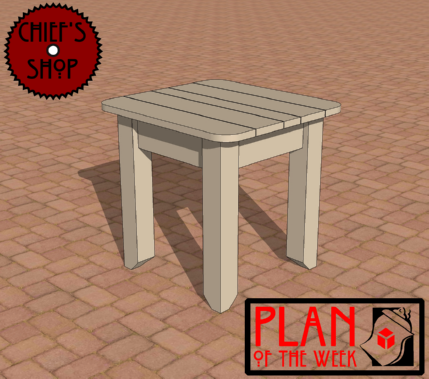 The Chief’s Shop Patio Side Table is a companion project to the Patio Chair project. Set it next to the chair as a handy spot to place drinks and food. It can also be used as a standalone table or plant stand. My usual tool suspects are needed to complete it – table saw or circular saw, miter saw, jig saw, drill driver, and Kreg Jig HD or a regular Kreg Jig. It’s made from 5/4x6 deck boards, a 2x8s, and 4x4s.